The jellyfish that we both admire and hate today, could have stepped out of a lost world dating back four hundred million years before the dinosaurs. They are old, primitive creatures, yet so effective that they hold their own in our modern world. Scientists would be interested to see what they actually looked like when they first appeared on Earth, but their soft bodies left few fossil traces. In this article we'll examine the few large species found in New Zealand waters. 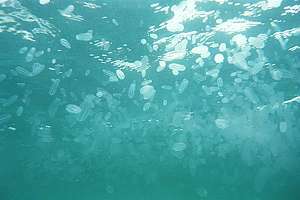 But jellyfish are also harbingers of pollution that kills other marine organisms. The jellyfish of the world are such effective ocean wanderers that they haven't diversified very much. With about 200 species world-wide, one could easily learn to identify them. But in New Zealand waters, jellyfish are not predictable either in numbers or species. Like the other members of the cnidaria or stinging animals, jellyfish are radially symmetric, resembling flowers. Their structure is simply a bag with cells on both the inside and outside with a mouth in the middle. Most have two life cycles (like butterflies and caterpillars), alternating between free swimming medusa (bell) and attached polyp, with a sexual and a budding type of reproduction. Although primitive, they nonetheless represent a pinnacle in elegant design and locomotion. Watching a jellyfish move through the water, lit by the flickering light broken through the water's surface, is always a breathtaking experience. 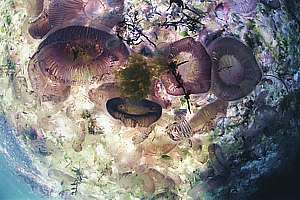 All cnidaria have stinging cells adapted to stun and catch prey (see box). 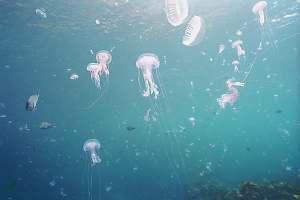 As jellyfish swim, they are aware of how they are swimming by means of a balancing organ, and they are also somewhat aware of their environment. One can observe them swimming almost horizontally upward until deciding to swim downward again. As their name suggests, jellyfish store large amounts of jelly. It makes them rather inedible because jelly contains almost exclusively water with no substance. Yet several creatures have learned to prey on them, targeting the good bits like gonads, which on a large jellyfish, can be a rewarding meal. Some jellyfish can live for two years or more. 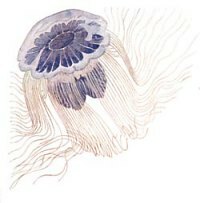 The stinging common blue jellyfish Cyanea lamarcki varies in colour from deep blue to pale white. It can reach almost 2m across. Its long tentacles hanging down from the bell's rim, can reach five metres while being almost invisible. It fishes the sea by swimming actively, letting its tentacles out and drawing them in again to eat the catch. 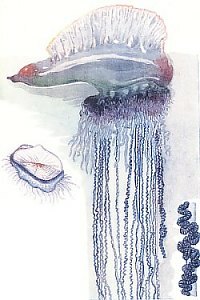 The slightly stinging purple jellyfish, Pelagia noctiluca has only few catch tentacles trailing from its bell and five feeding tentacles surrounding its mouth. It can grow 40 cm across. When first discovered, it glowed at night, presumably because it was feeding on sea spark dinoflagellates (Noctiluca scintillans). 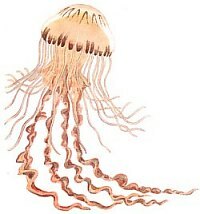 The sea nettle or brown jellyfish, Chrysaora hyoscella can grow to 30cm across, trailing its 24 brown tentacles to 2 metres behind. Its bridal train of four tentacles, often looks frilly. It can deliver potent stings and can be present in large numbers. 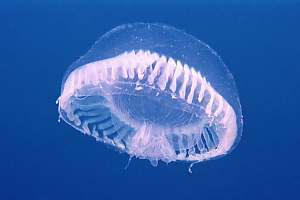 The harmless common jelly or moon jelly or earlobe jelly, Aurelia aurita becomes only 20 cm across and its sting is not able to penetrate our skins. Initially a fragile disc, it may acquire copious amounts of jelly to become hard and soapy. 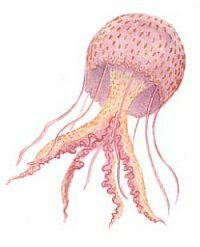 Many small tentacles hang from its rim, lashing small suspended particles onto its four feeding tentacles surrounding its mouth underneath the bell. The four earlobes on top are its gonads, which are eagerly sought out by leatherjackets and other fish. 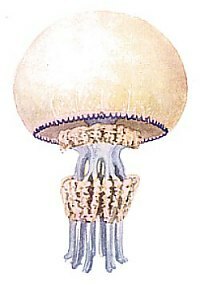 The harmless sea mushroom jelly Rhizostoma octopus does not have trailing tentacles to catch food. Its eight 'legs' are covered with a network of mouths that catch particles fanned down onto them by the swimming motion of the bell. 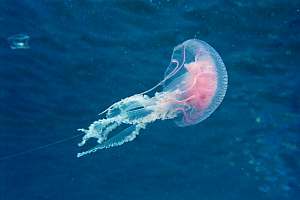 The portuguese man-of-war Physalia physalis and left the by-the-wind sailor Velella velella are siphonophores, which are colonies of specialised polyps that no longer cycle their lives between medusa and polyp. The colony has specialised polyps for catching and stinging, feeding, reproducing and inflating a bladder with carbon monoxide gas. Physalia delivers a burning sting but Velella is entirely harmless. f030804: In 1999 this siphonophore (Praya dubia), not seen here before, delivered painful stings to bathers. Its polyps look like a long, woolly barbed wire, up to 2m long. When one end stings the skin, it attaches, and in trying to rid oneself, more and more parts of the string attach to one's skin. Eventually the whole string clings to one's body, delivering powerful and painful stings. f029609: one of the many beautiful jellyfish visiting New Zealand's shores. This species remains rather small. f029503: a minefield of jellyfish often chases swimmers out of the water, since it has become impossible to avoid them. 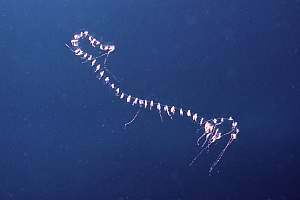 This photo shows a plague of Pelagia noctiluca. f029605: close-up of a Pelagia noctiluca jellyfish. f002804: a plague of sea gooseberries, but no fear of being stung. 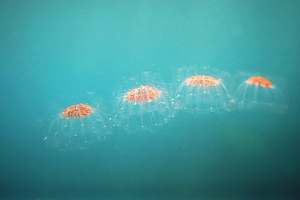 These firm jelly balloons, no larger than 3 cm, have ribs of vibrating hairs (cilia), by which they swim and steer. f016510: some jellyfish consist of joined-together seasquirts like these rosettes, each consisting of some 10 seasquirts. The orange bits are the seasquirt's gonads, a target for food. All cnidaria have stinging cells (cnidocytes), capable of inflicting rashes, stings or even burns. The animals can make these amazing cells at such rate that they can be used as dispensible tools. They can have different types, for stinging, sticking and gripping. The one shown in the diagram is of most concern to us since it is what causes the feared sting. The skin of a jellyfish tentacle is studded with these stinging cells. Each has a trigger hair (cnidocil) that activates a nerve circuit to unlatch the lid (operculum) and at the same time compress the cell. Several adjacent cells can be triggered simultaneously. Inside the capsule, the harpoon and its stinging thread (nematocyst) are ejected under pressure. The barbed harpoon is filled with poisons and everts itself like turning a finger of a rubber glove inside out, punching a hole in one's skin, releasing the poisons and pushing the thread into the punctured skin, to release even more poison. Once used, a stinging cell is discarded and replaced within two days. It is so amazing that such a complicated double-walled structure is made by a single cell!